If you love birds, frogs, bees and worms, if you've ever wished to create a backyard habitat but don't know where to start, read on. 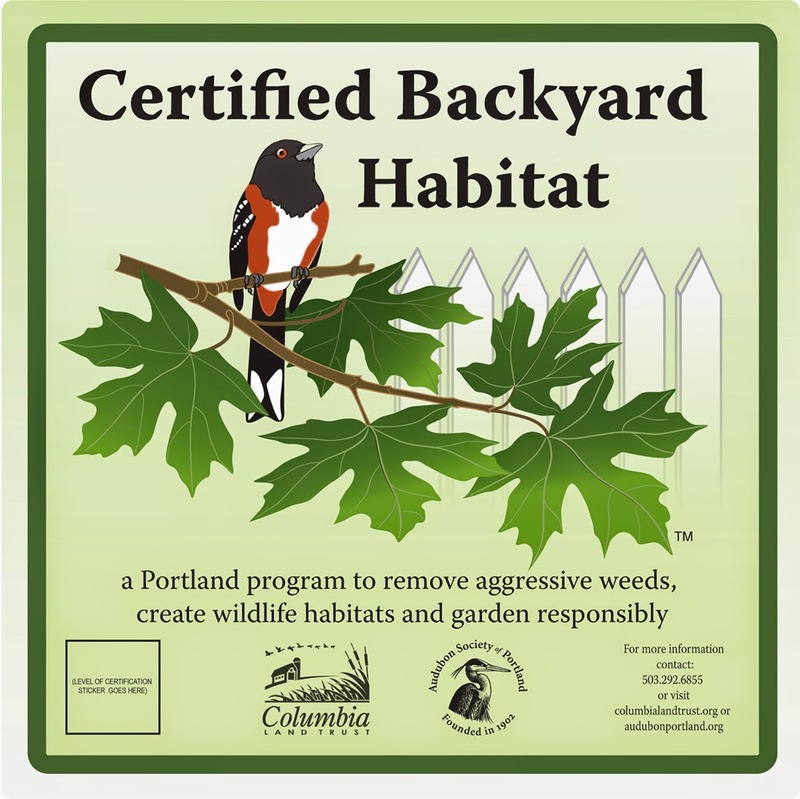 Here in Portland there's a wonderful program called the Backyard Habitat Certification Program to help. Whether or not you live in Portland you can certainly model your own efforts after BHCP's to wonderful results. Let's explore this inspirational program as it is very well-structured and has such useful information. Perhaps there's at least one bit of take-away information that can be applied towards creating your own garden habitat whether you are able to enroll in the program or not. The wonderful Nikkie West of the Backyard Habitat Certification Program amongst trilliums from a plant sale. I recently visited Nikkie West, the Backyard Habitat Program Manager for Audubon, at her Audubon offices in southwest Portland, to take a few photos and ask a few questions. First off, what is the BHCP? It's is a partnership between the Audubon Society of Portland and Columbia Land Trust. The mission is simple: It's "A Portland program to remove aggressive weeds, to create wildlife habitats, and to garden responsibly." To expand on that, it is also "to plant roots, create a habitat, transform the world, one yard at a time." How to do this? The concept is that people sign up to participate. A site technician visits to perform an assessment and to make recommendations. You receive an incredibly useful packet of information (all of this for $35) and a sign for the yard that reads "certification in progress." The program is broken into categories for you to follow. Within each category, you choose from a menu of items to accomplish for your own garden and, depending on how many items from each category you fulfill, you obtain different levels of certification. The levels are silver, gold and platinum. When you're ready, a volunteer visits your garden again and re-assesses to see how many items in each of the categories you have fulfilled. Your sign is changed from "in progress" to the one you see above with the appropriate silver, gold or platinum sticker applied. You then get to display your sign in your garden with pride, and your garden is officially part of the Backyard Habitat Certification Program. Myth: There is a misconception that the entire garden must be planted with native plants to be certified. This is not the case. To obtain silver certification, you must plant a mere 5% along with other criteria. That sounds manageable, right? Let's move on. The nature store at Audubon headquarters with some native plants out front for sale. Chickadee Gardens: How long has the program been in place? Nikkie West: It started as a pilot program in 2006 with the West Willamette Restoration Partnership, and it was so successful in that endeavor that it launched as a citywide program in 2009. CG: How many gardens are certified at this time? NW: 2,800 sites are currently enrolled. CG: What cities are served? NW: Portland, Gresham, Fairview and Lake Oswego with plans this fall to revisit the potential to add more. CG: Biggest myth about certification? NW: That you have to have all native plants! Only 5% needed for silver certification! CG: Can you recommend your three favorite native shade and sun perennials? Sun: shooting star Dodecatheon hendersonii, tiger lily Lilium columbianum, prairie shooting star Lithophragma parviflora. CG: What's the biggest challenge for new participants? NW: West-side participants seem to have some native plants to start with but massive invasive weed infestations. East-side participants have a native plant desert; that is to say virtually no native plants to start with. CG: Where does funding for the program come from? NW: From East Multnomah Soil and Water Conservation District, Metro, PGE, the enrollment fee participants pay of $35. CG: Advantages of being certified? NW: Better wildlife viewing! Site assessment and report, quarterly newsletter, discounts and coupons, too. See the website for full list. CG: (from my humorous husband) Why do you hate lawns? NW: We don't hate lawns, there's always room for a little lawn! CG: How has the program grown in the last five years? NW: The rate of enrollment has increased every year. This year the goal has increased by 300% over last year. CG: Easiest way to get started? NW: Sign up through the website. CG: If someone is not in your enrollment area, what are some other options? NW: You can always sign up for the national program - the National Wildlife Federation program - the link can be found here. A monarch caterpillar found our Asclepias speciosa or milkweed last summer. We were thrilled! I wrote about it here. 1. Invasive weeds: These weeds have been identified as culprits in changing our ecosystems for the worse, creating a domino effect and displacing native species vital for the health of our native species. Economic impact is often a huge factor, as is the case with a species such as blackberry or English ivy. For the program, you cannot have any of the listed invasive weeds on your property under each category listed. For silver certification, for example, the following must not be present: evergreen and Armenian blackberry, garlic mustard, giant hogweed, ivy, knotweed, orange hawkweed, pokeweed, policeman's helmet, purple loostrife, scot's broom, spotted knapweed, spurge laurel, traveler's joy, yellow archangel and yellow flag iris. Latin names are given on their website as are complete names for gold and platinum certifications. Here is a link to a poster about invasive plants with a few images. Invasive species take habitat away from what has evolved to live here and reduces biodiversity. More biodiversity means more good critters. 2. Native plants: Oh, boy! This is easy. For silver certification you have to have from 5 - 14% of your garden planted with natives. For gold certification, between 15 and 49%. For platinum between 50 - 100%. I think 5% is very reasonable. What this means is that 5% of your total available plant-able area must be nature-scaped with natives and also include at least three out of five vegetation levels (ground, small shrub layer, large shrub layer, understory canopy, over-story canopy). For platinum, you must have all five vegetation levels. Native meadow checkerbloom in my garden with a bumble bee. Ninety percent of all insects are specialized, meaning they share an evolutionary history with native plants and rely on them to survive. Since animals directly or indirectly depend on plants for their food, the diversity of animals in a particular habitat is very closely linked to the diversity of plants in the habitat. Tuck them in around your fabulous ornamental plants, there are wonderful selections out there. I have three blog posts dedicated to some of my favorite native plants, you can revisit those posts here, here and here. If you live in the Portland, Oregon-area there are many resources for you. Here is a link to a booklet published by Metro listing many native plants and here is a link to the BHCP photo gallery. The following nurseries all specialize or carry native plants: Echo Valley Natives in Oregon City, Humble Roots Farm and Nursery in Mosier, Oregon (they have a great selection of hard-to-find natives and wonderful Columbia River Gorge wildflowers too), Bosky Dell in West Linn, Oregon, Garden Fever in Portland, Portland Nursery, Xera Plants, and Cistus Nursery. Little Prince of Oregon wholesales to many West Coast retailers. Also, there are many native plant sales through Audubon if you sign up for the program so that you can find plants at a discounted rate. There are also many free nature-scaping and rain-garden classes offered, the East Multnomah Soil and Water Conservation District offers many, check them out here. A few of the plants left over from a recent native plant sale. There are some good ones in there! 3. Pesticide reduction: For all three levels of certification, use only YELLOW or GREEN zone chemicals, if necessary, according to an IPM strategy (integrated pest management). No use of RED zone chemicals. For searchable lists of red, yellow, and green zone pesticides see: www.growsmartgrowsafe.org. For platinum, also take the "No Pesticides" pledge and get your ladybeetle sign for your yard! If you are not in the Portland-area and so can't get your "Pesticide Free Zone" sign free from Metro, get one online here. 4. Stormwater management: This category means managing what falls from the sky onto your property. Increasingly more important as drought seems inevitable for much of the West. How to capture that precious resource? Large trees do a good job, as do eco roofs, disconnecting downspouts, removing impervious surfaces and installing rain gardens. A complete list is on the BHCP site. 5. Wildlife stewardship: Aaaw, my favorite. Who could resist putting up bird houses and bird baths? How easy and rewarding is that? Just make sure you maintain them and keep them clean. Oh, and keep your kitty inside. Ever hear of a catio? It's a cat patio, an outdoor enclosure for kitty. There are tours in Portland showcasing creative efforts on behalf of those of us who love birds and cats. There's a link at the bottom of the page to sign up for this year's tour. Also, pollinator-nesting habitats are a plus (brush piles or even mason bee houses), and if you have the acreage, wildflower and grass meadows are wonderful for pollinators and birds alike. You can help reduce bird window strikes (when you hear a "bonk" and you see a bird at the foot of your window) by installing these reflective decals or other decals of your own making. Again, refer to the website and choose three from the list of eight items for, say, a platinum certification. It's all quite flexible. Downy woodpecker in my garden this past winter. 6. Education and volunteerism: Lastly, time to give back if you are seeking platinum certification. That means either recruiting a couple of neighbors to sign up for the program, allowing your garden to be showcased on a garden tour for the program, volunteering for the program, or signing up for the Metro Master Gardener programs. Some of the resources in Nikkie's office library. Many familiar titles here! Native penstemon in my garden. Philadelphus lewisii or mock orange in my garden last summer. 98 ACRES of newly enrolled properties - 13 acres in Lake Oswego and 84 acres in Portland. 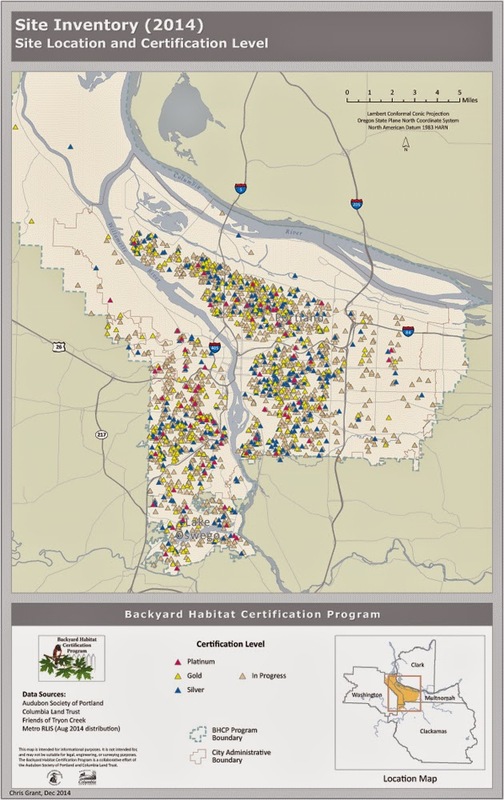 Map showing participation across the Portland area by certification levels. Corridors for wildlife are created when multiple properties offer safe refuge for wildlife. Biodiversity can then flourish in urban areas against all odds. It can be done! Yes, it matters a lot. My little lot plus your lot plus your friend's plus your neighbor's....it all adds up to corridors for wildlife to be able to pass through safely. It means that even in urban areas wildlife can survive if this is the new norm, that we are now the caretakers of wildlife. It seems that we are, and I for one take that to heart. I'm glad to know I have a program such as this to help guide me through the how-to questions and give me resources and ideas about ways to expand my 50 x 100 square-foot piece of nature and concrete. It works, I've seen it and I appreciate the value and quality it has brought to our lives. I have worked very hard to obtain platinum certification, and it has been a wonderful learning journey for me. It has been the reason I have learned about mason bees, eco roofs and so much more. It opened countless doors for me and for this, I thank them. It is the reason behind my passion for gardening and for this blog, frankly. If you are interested, I encourage you to explore their incredible website for resources and more. Sign up if you can. It may take a while to get someone out this time of year as spring is their busiest time but someone will, I promise. If you're not in the area hopefully this has inspired independent action and ideas and perhaps the impetus to start a similar program in your own community. That's it for this week at Chickadee Gardens, thank you for reading and until next time, happy gardening! Oh I love these posts! But, can I whine? When are they coming to West Linn???? I'm ready for them :) T - you've put together such an awesome post, chalk full of incredible resources. Bravo!! Thanks! So glad you like them, Jen. I know, I know. A lot of people want them in their neighborhoods, it all comes down to funding and city willingness to help fund it too. But, even if you don't have the official sign, you can still get in on the great benefits! You are very correct, Alan. I agree :) It's not about the sign, it's about the results, 100% spot on. Very informative and insightful post Tamara, to know more about this initiative in your area. And pleased to see that most of the well known nurseries there carry a good range of native plants too. I feel like I'd qualify under most of those parameters, as well. It would be worth it just to have someone come out and do a walkthrough for the suggestions. Great! It would be worth it to have someone come out, to be sure. They would offer a wealth of information. Give it a try! "East-side participants have a native plant desert; that is to say virtually no native plants to start with."...really? That's so depressing! Oh, it's true and depressing. But have no fear, Danger Garden has influenced the East Side in such a great, great way! :) Not just boring grass and bad shrubs....now we have a great mix of plants and it keeps getting better. Wow, there was a lot of information packed into this post. I am very interested in attracting more wildlife to my garden. Will need to do some more research on nurseries in the Eugene area that carry natives. Do you know, are all butterfly bushes on the no-no list or is it a certain one? I know that you can't buy some types in Oregon but I do see some at nurseries. I actually love them and mine was always buzzing with bees and hummingbirds until it died in last year's ice storm. I would love to tour gardens that have certification to get a good idea of what it involves and what it can look like in person. Hi Sharon, thanks for reading and for your comments! As far as butterfly bushes, there are sterile varieties available at nurseries now, those should be ok. There is a tour here in Portland every year of gardens that are certified, keep an eye out for that in Portland if you are interested. There is also a gallery of photos on their website and they have a Facebook page with tons of photos to get some ideas. If you are ever in Portland, you're welcome to come see my yard too! Thanks for reading and wanting to add more wildlife! Cheers! Mason Bees, Chickadees and Eco-roofs, Oh My!